My cousin, ever the schemer, found a website called Paynoincometax.com. Since I wasted three years of my life in law school, he asked me if it was legit. "If you argue it right," he said, "you don't have to pay taxes." Is it really true, as Irwin Schiff (the website's operator) claims, that the IRS has no legal authority to collect taxes? Governments (local and national) can be seen as mafias, as Randal Holcombe a libertarian economics professor argues. The taxes we pay are protection money. Some governments are better than others. Here in the US we get back some of what we give (more than many countries, less than others), in the form of public schools, libraries, public transportation, fire departments, clean water, roads, hospitals, and so on. But a lot of it is wasted on bailing out stupid rich people (or maybe not so stupid since they know how to get bailed out), unpopular wars, building bridges and tunnels to nowhere, breaking up small companies, etc. Coupled with some methods of collecting taxes (like double taxation of corporate earnings, double taxation of social security--you are taxed on a portion of your social security payments twice, first when you get your paycheck and then when you collect benefits), it's enough to make some people not want to pay taxes at all. So along come individuals like Irwin Schiff. Who pays the judge's salary? Why would any judge, ever, say that the money with which his salary is paid is collected illegally? Sure, there are individual cases where a court may say the IRS erred. To strike down the whole system, however, is entirely different. It'll never happen. Besides his paycheck, the judge also has to look out for his employer. The US is broke. Remember that Lending Tree commercial, the one where a goofy guy says, "I'm in debt up to my eyeballs"? He's not just a subprime borrower. He's America. A government in need of money will not let its citizens skirt taxes. But let's say, for argument's sake, that you argue persuasively and the court says taxes are illegal. The IRS will appeal. Let's say you win the appeal. The IRS will petition the Supreme Court, and they will take the case. Let's say you even win this one. How many years will you have spent on this (in jail, likely)? How much will you have spent on attorney fees? Even if you defended yourself it would be expensive. Wouldn't it be cheaper, less stressful, and less time consuming just to pay your taxes? Think taxation is unfair? Run for congress, or vote and campaign for someone who shares your views. While this will probably get you nowhere, it's better than spending years in court (and jail). There's also the option, untenable for most people, to move to a country where you'll pay less taxes. The guy from Paynoincometax.com is in jail, by the way. If he's released, it probably won't be until 2016. Maximize your deductions, but don't try any fancy arguments. They won't work. When you short sell a stock, you borrow it from your broker, sell it to someone else, and hope to buy it back later at a lower price. Your profit comes from the difference between the price for which you sell the stock and how much you pay to buy it back. There are various risks in short selling. Here are two important ones. 1. While your potential profits are limited (in the example above, the most you can make is $5,000--if XYZ goes to $0 a share) your potential losses are theoretically unlimited. Suppose you're wrong about XYZ or people are stupid and keep buying shares, and the stock keeps going up. You may lose far more than you bargained for when you (or your broker) close your position. Say XYZ goes to $100 a share. You're now down $5,000. If you don't have that extra cash in your account, your broker's going to demand money. 2. Related to this is the short squeeze. Let's say you're not the only one who thinks XYZ is going down. A bunch of other people short it too. Suppose some positive news comes out and people start buying XYZ. Those who have shorted XYZ will scramble to close their positions, driving demand up, and the stock will go even higher as a result. There are other problems with short selling. Sometimes you just can't do it. Your broker might not have any shares for you to borrow, or some silly government regulation may get in the way. There are two ways to mitigate the above risks and go around these potential problems. Both involve going long--buying instead of short selling. Let's say you think XYZ's price fall because its sector will go down. Or suppose you think XYZ will fall because the entire market will drop. You can buy an inverse or bear market ETF either for a sector or for a broad index, which I wrote about here, and provided a list of here. In buying an inverse ETF, you're going long. There's no margin involved (unless you want to buy on margin). You're not borrowing anything. The most you can lose is the amount of money you put in. But let's say you think XYZ is going down because it's overvalued, and you have no idea about its sector or the market in general. Inverse ETFs are too broad. Not to worry, you can buy puts on XYZ and profit from its fall. A put option is a contract between two parties, a buyer and a writer, on an underlying asset (a car, a painting, 100 shares of stock, etc). The buyer of a put has the right to sell the writer of the put the underlying asset at a certain price by a certain date. Suppose I have a car worth $20,000 that I'm thinking of selling within the next two years, but I'm worried that its value will decline. Someone (call him Bob) is interested in buying the car, and he thinks the its value will probably stay the same or rise. To protect the sale value of my car, I enter into a contract with Bob. I'll pay him $1,000 in exchange for the right, but not the obligation, to sell him the car for $20,000 within the next two years. This is an example of a put option. I'm the buyer and Bob is the writer of the contract. Let's say a year passes, and the market price for the car is now $15,000. I think it'll go lower still, so I sell the car to Bob for $20,000, as is my right by contract. While the car's value dropped by $5,000, I've only lost the $1,000 I originally paid Bob. On the other hand, suppose that almost two years after the contract is signed the car appreciates in value. Suppose its now worth $23,000. I decide not to sell the car to Bob, as is my right by contract. I can sell the car to someone else for $23,000. Since I paid Bob $1,000, I've gained $2,000 on my car's appreciation (current worth of $23,000 less $1,000 paid to Bob less car's value when contract was signed). Let's add a wrinkle to this example. Suppose the car doesn't belong to me, but to a car dealer. Suppose also that the car dealer is always willing to sell the car at the current market value. I enter into the same contract with Bob as outlined above (option to sell car to him for $20,000 within the next 2 years, in return for $1,000 paid to Bob). Suppose again that the car's value drops to $15,000 within two years. I can buy the car from the dealer for $15,000 and then sell it to Bob for $20,000. Since I previously paid Bob $1,000, I make $4,000 in profit ($20,000 contract price to Bob less $15,000 paid for the car less $1,000 paid to Bob for contract). That's four times my original investment. Talk about leverage. But suppose the dealer's car goes up in value and is now worth $25,000. I don't do anything. I've lost the $1,000 I paid Bob, but that's it. The first example, where the car is mine, is akin to selling puts on stocks you own. This is insurance. The second example, with the dealer's car, is closer to put options on stocks you don't own. There's another wrinkle we can add to both examples: you can sell the contract to other parties. The contract's value depends on the time left before expiration, and the market price of the underlying asset, in this case the car. This wrinkle brings us closer to put option trading. You can make money by buying puts on stocks if the stocks fall below a certain price within the contract's time frame. A great explanation of put buying and selling on underlying stocks can be found here. Just as with an inverse ETF, you're going long with a put. You're not borrowing anything. The most you can lose is the money you put in (like the $1,000 I paid Bob). In this way, buying puts is less risky than shorting stocks. For example, Washington Mutual (WM) may go out of business. One way to profit from this possibility is to short the stock. Another way is to buy puts. In terms of potential losses, look at how much more risky it is to short WM. In the last two days it's gone from under $4 a share to over $5.50 a share. It's up over 38% in two days! Suppose you had shorted the stock at $4 (if your broker let you). You might be getting a margin call now. Had you bought puts instead, you could lose only the amount you paid. Depending on the put's expiration date, you would still have a chance to make money on the position, as it's entirely possible that WM can go down to $3 in the next few weeks. If you had shorted the stock instead, you would have to make sure you have enough cash in your account, or your broker would close your position and/or start selling your other holdings. 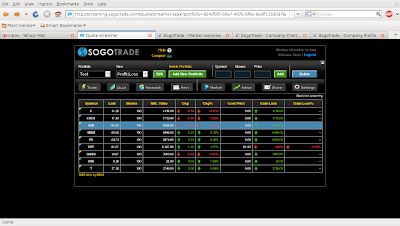 An advantage of puts over inverse ETFs is that you can buy them on indexes and many individual stocks. Also, as seen above, an advantage of a put is massive leverage. You can make a lot more money by buying $1,000 worth of puts than you can by shorting $1,000 worth of stock or even by buying $1,000 worth of an inverse ETF. What's the catch? Puts expire. After the contract's time period is up, it's worthless. Consider again my contract with Bob. Suppose two years after we make the deal, the car is still worth $20,000 or more. It's not in my benefit to do anything, so I let the contract expire without exercising it. I've lost $1,000. Suppose the very next day the car's value drops to $12,000. I can buy it from the dealer for this amount, but I can't sell it to Bob for $20,000 because the contract has expired. Unless he's a complete idiot (or somehow knows that the car will be worth over $20,000 in the future), he will not buy the car from me for $20,000. Since the contract expired, he doesn't have to do anything. With options, to make a profit you have to be right about two things: where the underlying asset's value is going (or not going), and over what period this will take place. This is the price you pay for leverage and the ability to put less money on the line. Next time you're about to short a stock, consider whether buying a put might be a better idea. Formerly Faith Bloom, then Zeolite, and now called ShengdaTech (SDTH), the company was founded in 1993, went public in late March 2006, and has traded on the NASDAQ since mid 2007. Based in Tai'an City, China, ShengdaTech operates in two segments. It is a leading producer of nano precipitated calcium carbonate products (around 46% of sales) and also manufactures coal based chemicals (around 54% of sales) for fertilizers and other products. Nano precipitated calcium carbonate (NPCC) is derived from limestone and has a variety of applications as an additive. NPCC improves and lowers costs on epoxy resin, oil based inks and paints, paper products, plastics, PVC building materials, and tires. Demand for NPCC is growing briskly, at double digit rates. ShengdaTech says that it has about a 10% share of its current market. There is plenty of room for growth both domestically in China and abroad. In 2007, international sales of NPCC were about 1% of the total. With a larger international sales team this year, the company expects its international NPCC sales to account for around 15%. Because of growing demand, SDTH will start building a new NPCC factory in August of this year. The facility should increase capacity by over 60% (from March 2008) and is expected to come on line by January 2010. ShengdaTech's patented technology (membrane dispersion) gives it an edge over competitors. It results in around 5% lower costs than ordinary NPCC manufacturing. Moreover, ShengdaTech's NPCC production is situated close to limestone mines, lowering transportation costs. Its new factory will also have easy access to limestone. Gross margins at the NPCC segment are around 40%, with revenue growth expected to be around 50%. The chemicals segment is growing too, though slower (revenue growth was around 7% in 2007), and provides SDTH with some cash flow. Gross margins in the chemical segment run at around 25%. Faster growth may be achieved through acquisitions. Overall margins were around 34% in 2007. Because of stronger growth in the higher margin NPCC segment, these are expected to increase to 36% in 2008, and may top 37% in 2009. ShengdaTech is led by 46 year old Xiangzhi Chen. He has been with the company since its creation and has proven himself a capable leader. Chen owns over 40% of SDTH stock. These positives come with risks. 1. NPCC sales growth may slow if the company does not keep its competitive edge. Less expensive or better products by competitors may take away customers. 2. The company has negative cash flow. It may have to take on more debt (SDTH recently sold $115 million worth of 6% notes, convertible at around $9.94 a share and due in 2018) or make a secondary share offering. 3. There is a key man risk associated with the CEO, Chen. While his very significant stake in the company can bode well for shareholders, his interests may not always align with them. Should he decide to leave the company or reduce his stake, the stock price can be hurt. 4. Because of governmental regulations, SDTH is moving its chemicals facility to a different city. It has to close shop by November 2008. The company says that it will be compensated for the move, but this is not certain. If the move is delayed or runs into problems, profits at the chemical segment may be hurt. 5. The chemical segment's sales are highly cyclical, with potentially wide profit swings. There is less demand in the winter months. The Chinese government sets fertilizer prices, which may not always be to SDTH's benefit. 6. ShengdaTech's supply chain is very concentrated. For example, around 4/5 of its raw materials were bought from just 10 suppliers in 2007. On top of this, raw materials costs are rising. 7. The company deals with dangerous materials. Accidents can occur, which can result in loss of life and production stoppages. Added to this inherent risk is where ShengdaTech's facilities are located. China has had earthquakes recently. Severe weather is also not rare. A snowstorm closed a factory for a short time earlier this year. 8. While the company estimates that its highest NPCC growth will come from PVC materials, demand has been softening. If China's economy continues to slow, demand for tires may also weaken, reducing NPCC demand. 9. There is always political risk associated with China. Some or all of these risks are probably priced into the stock's price already. Despite a significant rise in recent weeks, it is still considerably off its 52 week high. The low analyst earnings estimate for 2009 is $0.71 a share. At a recent price of $9.46 a share, SDTH is trading at around 13.3 times 2009 earnings. Disclosure: I do not own any ShengdaTech shares, but may buy some in the future (at least 3 days from when this is posted). I am grateful to the reader who mentioned this stock in an email. This post is intended mainly for new investors. 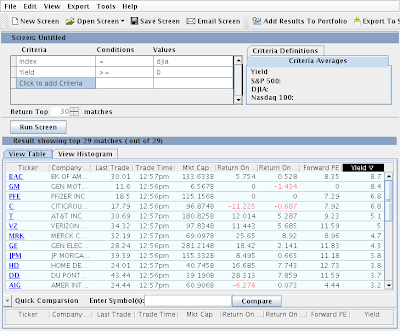 A stock screener is a great tool for initial stock research. There are thousands of stocks out there. Stock screeners can be used to whittle these thousands down to a small handful, depending on the criteria you use. I'll be using Yahoo's screener here, as MSN's (which is more powerful) only works with Internet Explorer (but not IE8 Beta last time I tried it) and Windows, and some people may not have this software. Where relevant, I will mention the MSN screener. Before using a stock screener, you should have an idea of what kinds of stocks you're looking for, e.g., companies with overall great records, large cap value, small cap growth, mid cap basic materials companies with dividend yields greater than 2%, etc. When you load the Yahoo screener, you'll see a "click to add criteria" button. Clicking on this will give you a drop down menu of 13 categories, each of which have several criteria. Let's go through a couple of simple screens to see how it works. You probably heard of the Dogs of the Dow. These are the ten highest dividend yielding companies in the Dow Jones Industrial Average. If you're interested in the investing strategy, click here. Let's use the screener to find the dogs. Click on "click to add criteria," go to "descriptive," and then "index." You'll see that in the column with the heading "Conditions" there now appears "select a condition" in green. Clicking on this, you'll see that there's only one choice, an equals sign ("="). (You will have more choices depending on the criteria you selected). Click on the equals sign. Now you'll see "Select a Value" show up under the "Values" heading. Here you have two choices, S&P 500 and Dow Jones Industrial Average (DJIA). 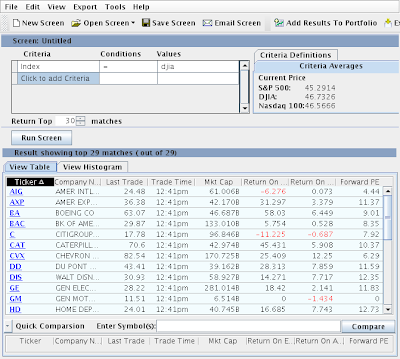 Had Yahoo's screener been more powerful, more indexes would be listed. Let's pretend the error didn't occur. The other criterion in being a dog is being one of the top ten highest yielding Dow components. So, click on "Click to add Criteria," then on "dividends," and then on "yield." In the conditions column, you'll find a choice of greater than or equal to (">="), less than or equal to ("<=") and "between," from which you can select a range of values. MSN's more powerful screener has other options, including "high as possible" and "display only." If you were using MSN's screener, you'd click on "display only." Since we don't have this choice here, however, click on ">=." Since our criterion is yield, the number we enter in the values field will be a percent. So, suppose you enter "2." What you're really entering is 2%. This would mean that you're screening for companies with a dividend yield greater than or equal to 2%. While all the Dogs of the Dow currently yield over 3.5% (as of writing), this is not always the case. It's possible, though unlikely, that they can yield less than 1%. If this were to happen, I'd stay away, as they probably would be grossly overvalued. 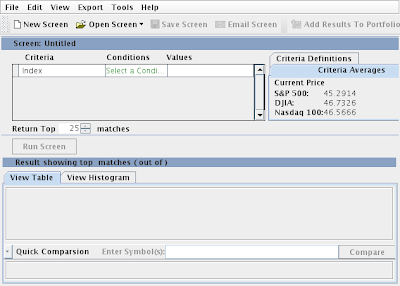 Given that the yields can vary, select "0" in the values column. This screen will give you all the DJIA components with a yield greater than or equal to zero (because of the error, mentioned above, the screener only gives you 29 companies, but we'll ignore that). When you click on the "Run Screen" button, the companies displayed in your results won't change. However, you'll notice that in the results you now have an extra column, "yield." By clicking on it, you can sort your results. When you sort yield by descending order (company with the highest yield goes first), your top ten results are the Dogs of the Dow. But wait. Here's another example of how stock screeners can give you bad information. Notice that General Motors is in the second spot. The company recently eliminated its dividend. Yahoo has not updated its data to reflect this yet (at the time I ran the screen, anyway). As of writing, then, the Dogs of the Dow are Bank of America, Pfizer, Citigroup, AT&T, Verizon, Merck, GE, JP Morgan Chase, Home Depot, and Du Pont. (Remember to check Alcoa, since it's not listed in the results. It happens to yield just over 2%, while Du Pont yields around 3.7%. So our list is not affected, but it could have been). Let's run another screen. Clicking on the "New Screen" button will reset the stock screener (if you want, you can save and/or export your results before resetting the screener by clicking on the file menu). Let's go for something a bit more complicated. Say we're looking for a company with a decent record of performance, and a solid balance sheet. Beyond the extremes, every investor's opinion of what constitutes good performance and what makes for a solid balance sheet is different. The figures presented here are for demonstration purposes only. Let's start with the balance sheet. Luckily for us, the Yahoo screener has a category called "Balance Sheet." Other screeners may have something like "financial health" or "financial strength" instead of "balance sheet." I'll go through each of the nine criteria in the balance sheet category that Yahoo lists. 1. Price Book Ratio is determined by dividing the company's stock price by its book value per share. Another way to get this figure is to divide the company's market capitalization by its book value. Book value is how much you would have left over if you sold all the company's assets (buildings, trucks, chairs, computers, cash, etc) and paid all its liabilities. Divide this number by the number of shares the company has outstanding, and you have its book value per share. Dividing the stock's price by book value per share gives you the price/book ratio. An argument can be made that this is really a valuation measure and shouldn't be in the balance sheet category. Most stocks trade at price book ratios of more than 1. This is because investors are willing to pay more than just a company's liquidation value. For example, there's more to Pepsi than its office equipment. When companies trade at price book ratios of less than one, there are usually two or three possibilities. Either the market isn't paying attention to the company or is irrationally discounting its value, the market does not believe that the company's book value really is whatever number is reported, or the market believes that the book value will decline in the future. Generally speaking, buying a stock with a price book ratio of less than 1 means you're buying the company for less than its liquidation value. If it were closed today and all its assets were sold, you would make a profit. However, take a look at how financial stocks have traded recently. Some have had their price/book ratios go below 1. This indicates that investors think the companies' book values are lower than reported or can quickly become so. The next write down, it seems, can be just around the corner. However, also generally speaking, the lower the price book ratio is, the better. For example, master investor Benjamin Graham liked companies with price book ratios of 0.66 or less. 2. Cash per share is how much cash plus cash equivalents the company has, less its short term debt, divided by the number of shares outstanding. This figure is more useful as a percentage of share price. For example, having $20 cash per share doesn't say much until we know how much the stock trades for. There's a difference between a stock trading at $1,000 with $20 per share and a stock trading at $100 with $20 per share. While higher numbers (compared to share price) are usually better, an unusually high number, say more cash per share than the share price, can be a sign that the company is experiencing problems. 3. Total cash is the sum of the company's cash and cash equivalents. 4. Book value was explained above in the price book ratio. 5. Total debt is the sum of all the debt the company has. 6. Total Debt/Equity is total debt divided by the shareholders' equity, which is all the company's assets minus all the company's debt. Generally speaking, the smaller this number, the better. A company with a total debt/equity ratio of 0 has no debt. Usually, this ratio should be put in context. Compare it with the average of the industry the company is in. Having a debt equity ratio of below industry average is generally a good thing. But note that a company can grow earnings faster with more debt. (Think of buying stocks on margin; your potential gains are greater--but so are your loses). More powerful screeners have something called "interest coverage ratio," which is the company's earnings before interest expenses and taxes divided by interest expenses. The higher this ratio the better. Generally, look for companies with an interest coverage ratio of greater than 1.5. 7. Current Ratio is determined by dividing the company's current assets by its current liabilities. We've seen what assets are above (in price book ratio). Current assets are things that are more readily available, like cash, accounts receivable, and inventory. Liabilities are what the company owes, like its bills and debt. Current liabilities are those that are due soon, within a year or so. The higher the current ratio, the better. Let's say a company's current assets are $5 million and its current liabilities (debt and other payables due soon) are $1 million. The company's current ratio is 5. This company can pay all its current debts and have enough left over for unforeseen expenses as well as opportunities. A current ratio of less than 1 indicates that the company has less current assets than current liabilities. For most companies this is not a very good sign. But consider a giant like Procter & Gamble. As of writing, the company's current ratio is less than 1. Does that mean it'll go out of business? Hardly. But for a smaller company, one that cannot borrow as freely, a current ratio of less than one may be a sign of trouble. Screening for companies with a current ratio of 2 or higher is generally a good idea, but note that you'll probably eliminate companies like Procter & Gamble from your results. As with debt/equity, a company's current ratio may be more illuminating if it is compared with its industry's average. 8. Long Term Debt/Equity is the company's long term debt (usually debt due in more than a year) divided by shareholders' equity. Again, the lower this number is, the better. But look at the industry average to put it in context. 9. Quick Ratio is like the current ratio. It is determined by dividing the sum of the company's cash and cash equivalents (inventory isn't included) by its current liabilities. This ratio shows how well as company can respond to sudden expenses or opportunities. Does it need to take out a loan, or can it just pay with cash? As with the current ratio, the higher the quick ratio the better. Let's screen for companies with solid balance sheets. Let's make Total Debt/Equity <= 3.5 and Long Term Debt/Equity <= 3.5. This will screen out all the outrageously leveraged companies. Note that there will still be plenty of companies with too much debt, but putting these ratios too low will screen out companies in capital intensive industries. If we were using a more powerful screener, like MSN's, instead of putting in actual numbers, we could have used "<= industry average" in the value field for better results. Let's make the price to book ratio <= 2. This brings our number of matches down to 535. Still an unmanageable amount. Let's look beyond the balance sheet to the company's valuation and past performance. There are a number of various ratios. Here are the ones I use most. 1. Price Sales Ratio (P/S in the "valuation" category in Yahoo's screener). This is determined by dividing the stock's price by its sales revenue per share. Sales revenue per share is the company's sales revenue over the last 12 months divided by the number of shares outstanding. This ratio is more useful to look at than the Price Earnings ratio (P/E) because sales figures are harder to fudge. Note, though, as with all per share figures, the number of shares has an effect. For example, the sales per share figure can grow while the company's actual sales remain flat or decline. How? A company can decrease the number of shares outstanding by buying back stock. Also note that sales say nothing about the company's profits. If costs rise, a company can post lower profits on higher sales. Generally speaking, the lower the price/sales ratio, the better. But setting the ratio too low can make you miss out on good companies. 2. Return on Equity (in the "profitability" category in the Yahoo screener, may be called ROE in other screeners) is determined by dividing the company's net income by shareholders' equity. Net income is all the money the company takes in less all its costs (taxes, depreciation, interest payments, etc). Return on equity measures how much profit a company makes on its shareholders' investments. The bigger this number is, the better. 3. Net Profit Margin (Profit Margin ttm in Yahoo screener) is the company's net profits divided by total revenues for the last 12 months. The higher this number is, the better. It is useful to compare this ratio to the company's industry average. Don't expect a leading supermarket chain to have margins higher than a leading software company. Having above industry average profit margins usually indicates that the company is an industry leader that commands more pricing power or has lower costs. Let's make the price sales ratio <= 5 (you can fiddle with this one), return on equity >= 20, and net profit margin >= 20. This gives us a total of 14 matches: DRYS, ESEA, EXM, FSTR, HLTH, ITRN, NWD, ORH, RDC, SGY, UWN, and YZC. All of these companies have solid balance sheets and decent margins and returns on equity. They're also not too expensive based on their sales. Are they good investments? Beats me. Further research is required. I'd like to know a lot more about each company before buying or shorting it. What is its earnings growth like, is it accelerating, who's in charge, are there opportunities for growth in the future, do they pay a dividend, what does the company do, who are its customers, are margins widening or contracting, etc? Some of these can be screened for, but provided the list isn't very large I like to look at the companies individually. Remember that a stock screener's results are only as good as its underlying data. There can also be flaws with the screener itself, as we saw with the Dogs of the Dow screen. Regarding the underlying data, always use more than one source for each company you research. Look at the company data on Yahoo, Google, MSN, MarketWatch, etc. You'll no doubt notice that the figures for the same company are different depending on the data provider. This is because the data provided are often from different periods and are usually based on per share amounts. If in doubt, consult the investor relations site of the company in question. This should be stressed, a stock screen should be the first step in a much longer research process. Stock screeners are for generating ideas for further research and limiting the number of companies you go through. They are never buy recommendations. I hope this was useful practice for novice investors and made stock screeners a little less confusing. Hopefully seasoned investors got something out of this too.